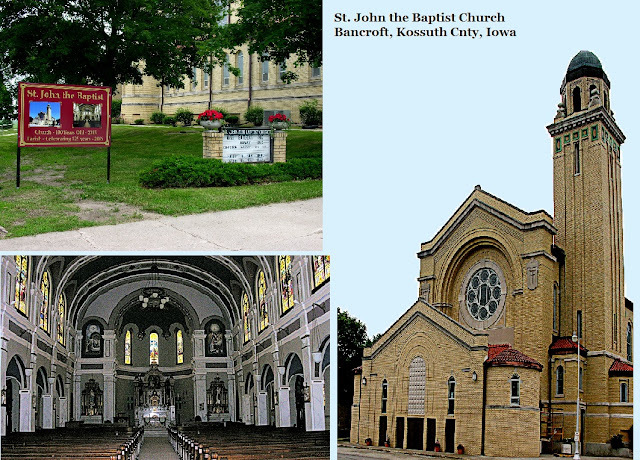 Why did my relatives, the Schötls, and many families from Mönchhof (now in Burgenland, Austria) emigrate to Bancroft, Kossuth County, Iowa? As early as 1882, Catholic families came to make their homes in and around Bancroft. It was designated as an out-mission of Algona and Mass was celebrated in the Bancroft public school building for the next several years. In October 1889, Bishop Hennessy directed Father Nicholls to build a church in Bancroft and the 36' x 60' structure was completed October 19, 1890. It was deemed a separate Catholic parish within the Dubuque diocese. From our research we put together a list of the Burgenlander burials in Kossuth County, many in Bancroft. We started with the "Burgenlander's Honored and Remembered" listed by the Burgenland Bunch. We went through and created a spreadsheet of the families who came from the Neusiedl area villages buried throughout the U.S. We sorted that for just the Iowa burials. We next sorted that alphabetically by town burial site in Iowa. What we found is that the Bancroft St. John the Baptist Cemetery has burials from Mönchhof immigrants representing 14 families. 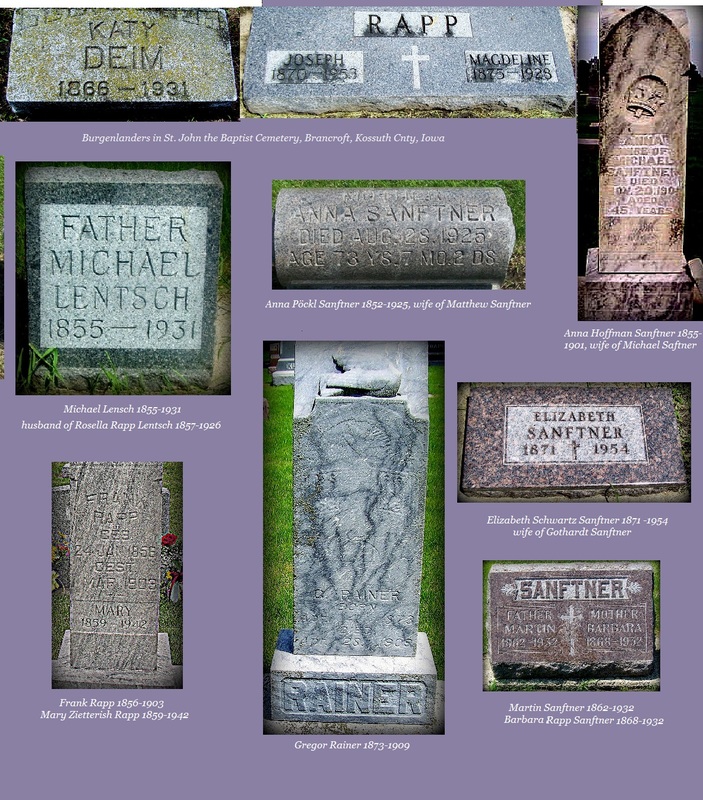 To these we could add others, like the Schotls, who were Bancroft residents but with no burials. Shan contacted Judy Vaske, the business manager at Saint John the Baptist Church in Bancroft with our list. 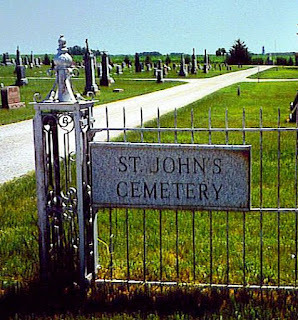 Judy agreed to bring the cemetery records and meet us at St. John the Baptist cemetery to locate the graves. The cemetery books are very detailed with the graves marked according to the placement in quadrants. A map is posted on a board in the center of the cemetery. 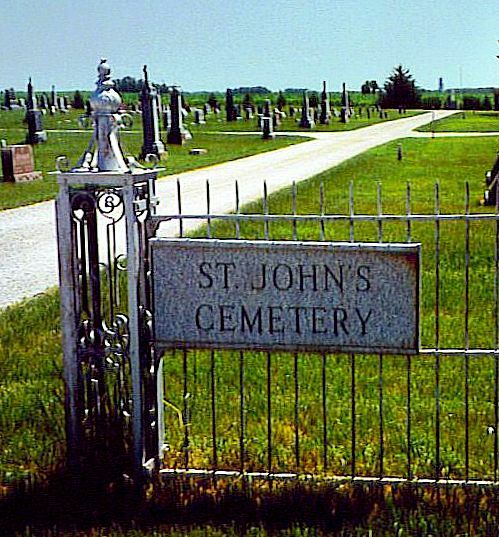 The cemetery is in excellent condition and well cared for. We were able to locate and photograph all but 3 of the Burgenlander graves. These we assumed were either never marked, marked but missing, or the stone was buried under the grass. After we finished at the cemetery and had a little lunch in downtown Bancroft, we headed to the church where we met with Lori Geitzenauer, the Director of Religious Education for St. John the Baptist Church. She helped us search the church records for births, baptisms, confirmations, marriages and burials. She took a tremendous amount of time and was very patient with us. We looked for Schötl/Hoffman records, then Lori showed us other names from our list. More time with these records would give a better picture of this Burgenland group. The lesson was how valuable church records can be in genealogy. We knew that Michael Schötl and Elizabeth Hoffman had 4 sons born in Iowa but there was no record of these births at the county. The church records are the only documents we have about the boy's birth dates and given names. The parish of St. John The Baptist is nearing its 125th year in 2016 and is currently in the 100th year since the building of the church. The quasquicentennial celebration is set for July 2nd 2016. 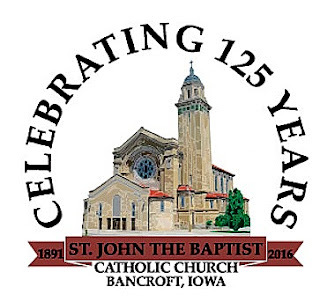 A call for stories, pictures and artifacts has been made by the church's History Committee. Information can be mailed to PO Box 94 Bancroft, IA 50517. The Schötls and others didn't stay long in Iowa. According to the 1905 Minnesota State Census, the Schötl family, with the exception of Frank and Mary, were living in Columbus Township, Anoka County. It was in the Anoka County records and with the help of the Burgenland Bunch that we discovered that many of their Hungarian neighbors from Mönchhof had settled on adjacent or nearby farms in Columbus Township.